***** Picking wild mushrooms to eat can be deadly. Unless you acknowledge that and become a serious student that one wild mushroom in your basket that you eat could be your last. Having made my 'Dangerous Declaration' above, let me state that the mushrooms depicted on this site are the ones I have been picking, eating and / or using for medicinal benefit for close to 40 years. The articles are my accounts, not a rehash of someone else's. It's not all of them because this is a new site. I will add more as time permits. When each of these species were 'new ones' for me, there was always that declaration in my mind. However, notwithstanding the fact that I have been eating these for so long not everyone can eat the same things and have the same response. Keep that in mind too - always - when ingesting anything new for the first time. If you live in the northeast U.S.A., specifically the Mid Atlantic states ( Delaware, Maryland, New Jersey, New York, Pennsylvania, West Virginia, Virginia and Washington D.C. ), then you more than likely will have the same varieties appearing during the seasons I have indicated, weather conditions permitting. I don't get out West or down South so I can not speak for what mushroom varieties appear there. I started this site to help people that live in my region and are interested in which varieties can be found, the season they generally appear and the weather conditions existing during their discovery. I also sell select varieties by 'Pre-order'. Email for prices and seasonal availability. Browse Mushrooms Bear's Head Tooth - Hericium americanum Black Trumpets - Craterellus fallax Brick Caps - Hypholoma sublateritium Chicken of the Woods - Laetiporus sulphureus Comb Tooth - Hericium coralloides Giant Puffball - Langemannia gigantea Hen of the Woods - Grifola frondosa Horn of Plenty - Craterellus cornucopioides Horse Mushroom - Agaricus arvensis Oyster Mushrooms - Pleurotus ostreatus Shaggy Mane - Coprinus comatus Two-colored Bolete - Boletus bicolor Hedgehog Mushroom - Dentinum repandum Golden Chanterelle - Cantharellus cibarius Smooth Chanterelle - Cantharellus lateritius Blewits - Clitocybe nuda Honey Mushroom - Armilleria mellea Lilac Bolete - Xanthoconium separans - Boletus Red Chanterelle - Cantharellus cinnabarinus Cauliflower ( Eastern ) - Sparassis spathulata Quilted Green Russula - Russula virescens Corrugated Cap Milky - Lactarius corrugis Almost Bluing King Bolete - Boletus subcaerulescens Little Sweet Tooth / Hedgehog - Dentinum umbilicatum Winter Chanterelle - Cantharellus tubaeformis Lion's Mane / Old Man's Beard Yellow Chanterelle Purple-gilled Laccaria Meadow Mushrooms / Pinkies Hygrophorus Milky Voluminous-latex Milky Rooted Oudemansiella The Prince Common Laccaria / The Deceiver Chaga Mushrooms ( medicinal ) Lingzhi ( medicinal ) Artist's Conk ( medicinal ) Turkey Tail ( medicinal ) Tinder Fungus ( medicinal ) Dryad's Saddle Birch Polypore Topics Mushrooms Main Bountiful Shaggy Mane Processing Breaded Giant Puffball Slices Dehydrating Sheep's Head Maitake Green Tea Morel, Ramps and Sausage Gravy Mushroom Essence from Giant Puffball Processing Lingzhi / Reishi Recovering High Growing Hericiums Rooted Oudemansiella Cutlets Salvaging Shaggy Mane Parts Salvaging Shaggy Mane Stems Sheep'shead Mushroom Patty Simmer/Freezing Sheep's Head Eating And Drinking Artist's Conk Tinder Fungus Processing - Tea or Broth. Eating Ling Zhi / Reishi Mushrooms. SEASONAL - Late Summer - Fall. August - Mid September Availability. Mid September - October Availability. 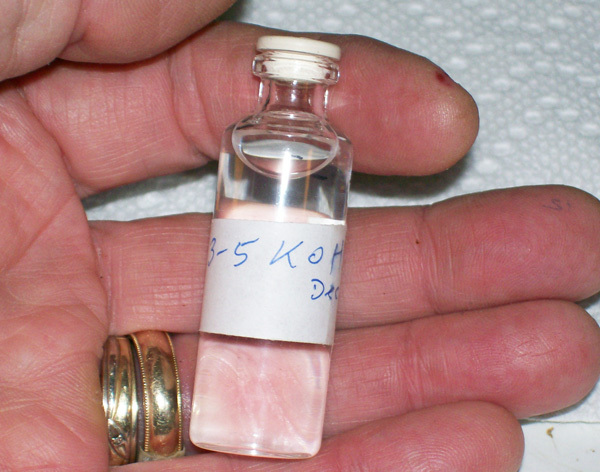 TESTING REAGENTS: I have some 3 - 5% KOH available if you want some. I make it up as I need it. It sells for $3.00 + S & H ( U.S. A. ) for a 10ml vial. Email me if interested. SEASONAL - Late Summer to Fall. Mid August - September Availability. Mid September - Mid October Availability. SEASONAL - Summer to Late Summer. Late June to August Availability. SEASONAL - Spring & Fall. Mid May - Mid June, then again from Mid August to October Availability.